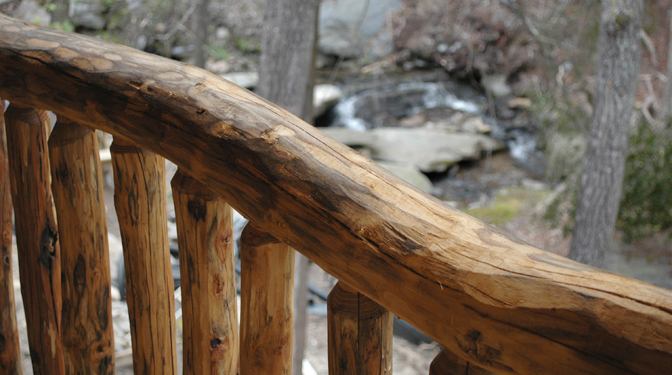 There's no better way to truly experience the glory of the Blue Ridge Mountains than by lodging in this elegant creekside cabin rental. 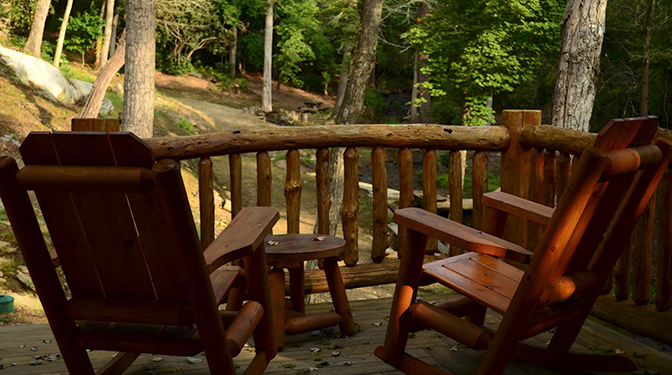 Creekside at High Rock is the perfect example of the very best that the Blue Ridge Mountain vacation rentals has to offer. 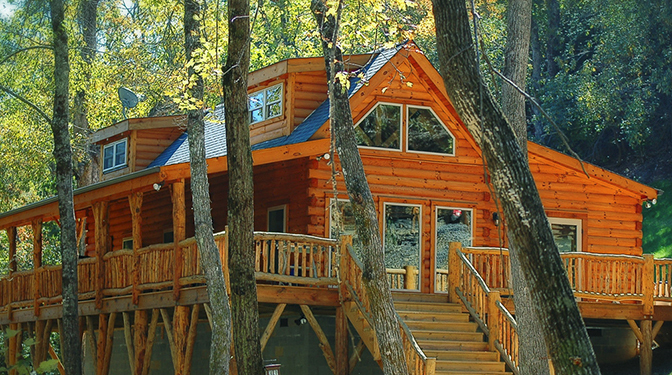 Creekside is a very special ( located 20 feet from the creek ), 2 bedroom cabin that can sleep up to 6 guests. 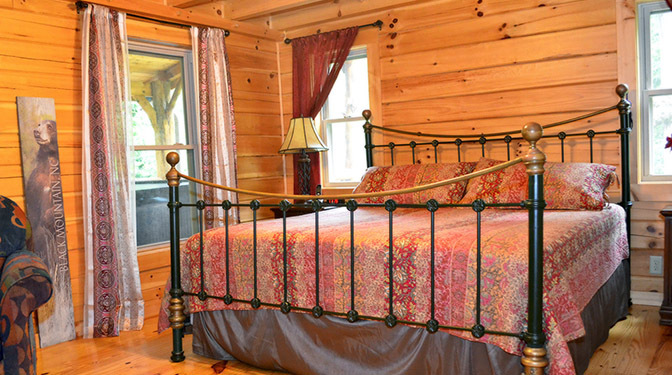 You can sleep comfortably to the sounds of rushing water in the king size master bed, two full beds or the queen sleeper. 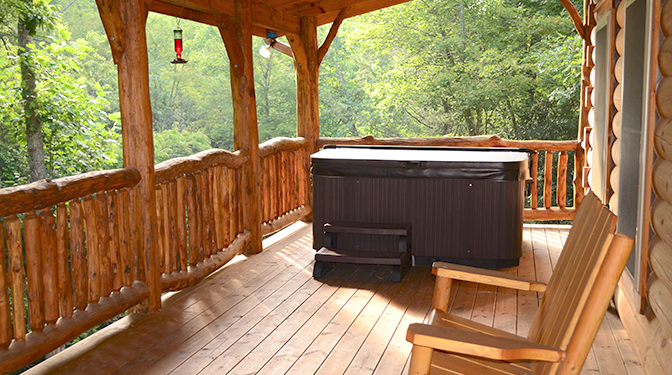 Amenities include: 4 person soothing Hot Tub, 3 HDTVs and one BLUE RAY player, a spacious, fully equipped kitchen, a massive exterior hard-wood decks that includes cedar rocking chairs. 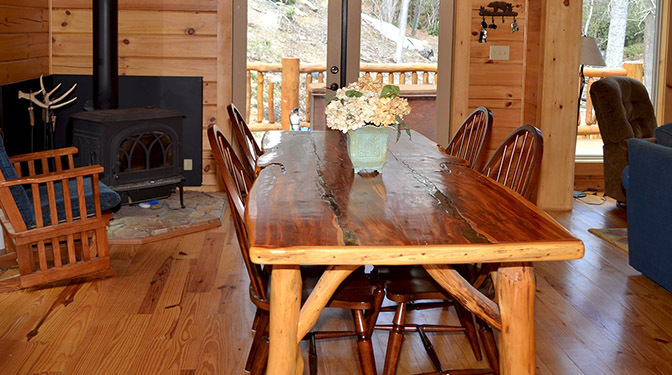 A wood burning stove and outdoor fire pits, free fire wood is provided. 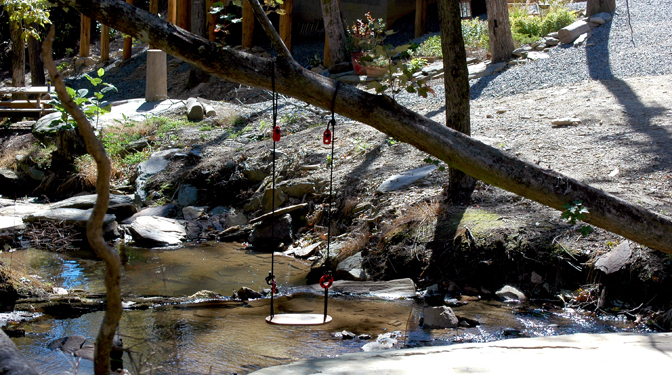 Hiking trails and the privacy of your own creek are just footsteps away from the home! 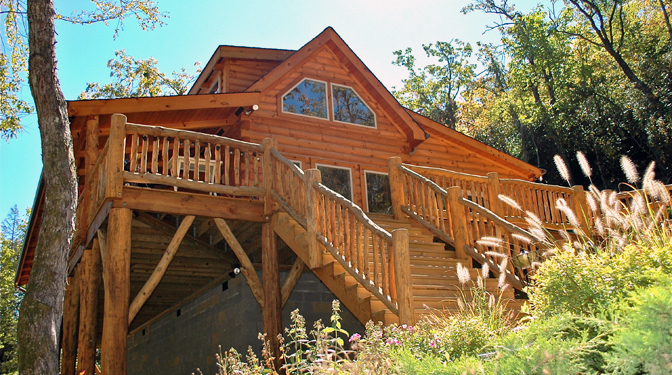 This is a mountain cabin rental that takes mountaintop luxury to a new summit! CHECK IN TIMES ARE ANYTME AFTER 4:00 PM. THERE WILL BE INSTRUCTIONS TO THE HOME IN THE GUEST BOOK ON THE KITCHEN TABLE UPON YOUR ARRIVAL. 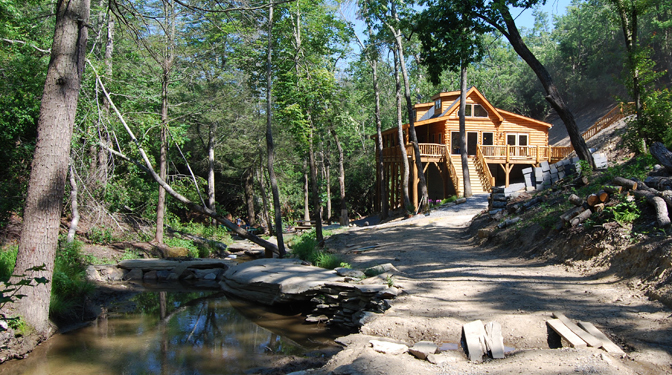 Hiking Trails, Outdoor Fire Pit ( firewood supplied ) and Creek right out your front door. 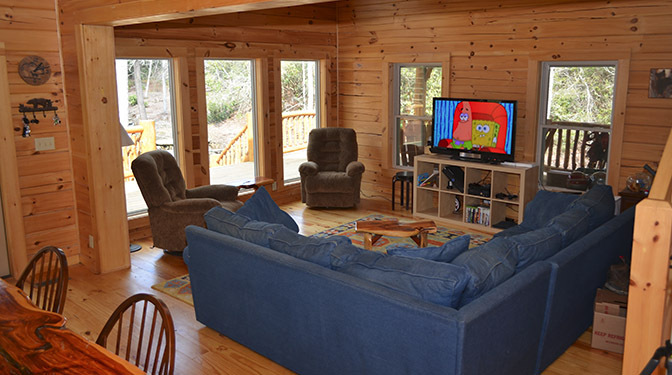 The cabin is absolutely exceptional! Mike (who has been the best cabin host I’ve come across) had decorated with Christmas lights and a beautiful fresh Christmas tree. That was a very special touch. We have been going to cabins for years now for Christmas and not once had we come across that. We even bring our own Christmas lights...this time they stayed in the suitcase. Next surprise was a delicious bottle of local red wine that he had left for us. I kept looking where I can buy those the whole vacation ..that’s how much we liked it. The house is very clean, well appointed, beautifully decorated. We absolutely loved the rug in the living room which is put over some padding to be even softer. It was great to stretch while watching tv and play with our doggo. Loved the rocking chairs too! I hardly even used the couch. These chairs were awesome My husband was very impressed with the firewood that was left for us. We typically have to struggle to go find firewood and bring it, which is a pain especially on the first night. Everything in the cabin worked great, and the surroundings are awesome too. 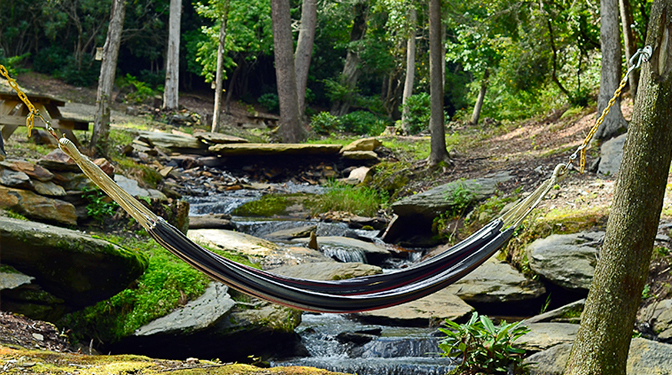 There is a cute hammock by the creek and I managed to get in it even though it was so cold. Mike helped me figure out a great running path. I’m a runner and on mountain vacations often struggle to get in my minimum of 5 miles a day. Not here! From veterans park and into town and back made for perfect 5 mile runs and I got to bring along my pup with me since it was mostly sidewalks and trails. Thank you Mike! We will definitely be back! 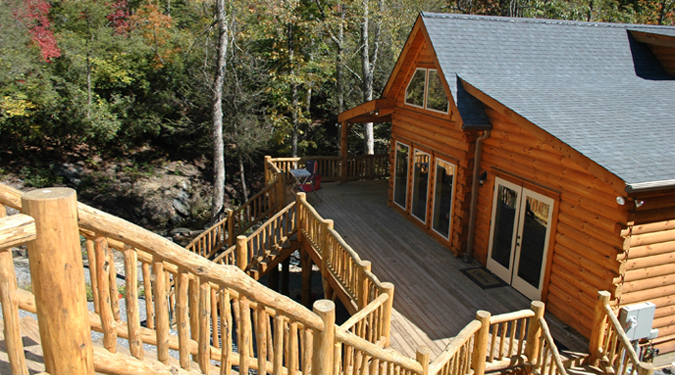 This is a wonderful cabin that is nicely secluded with a beautiful creek right next to it. There were 4 of us staying and we had ample room and thoroughly enjoyed our stay. 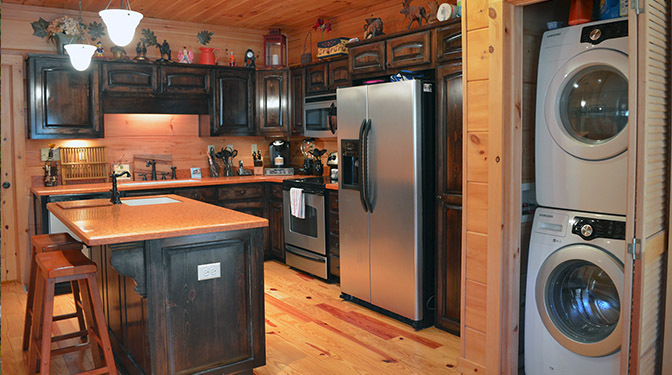 The cabin is nicely furnished and has a well-equipped kitchen. 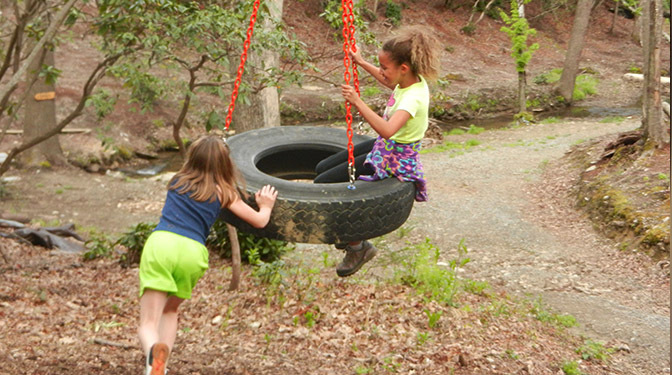 We like that it is away from busy highways/streets and is in its own little area, but still an easy drive from Asheville. We look forward to staying again. I cannot say enough nice things about this place. 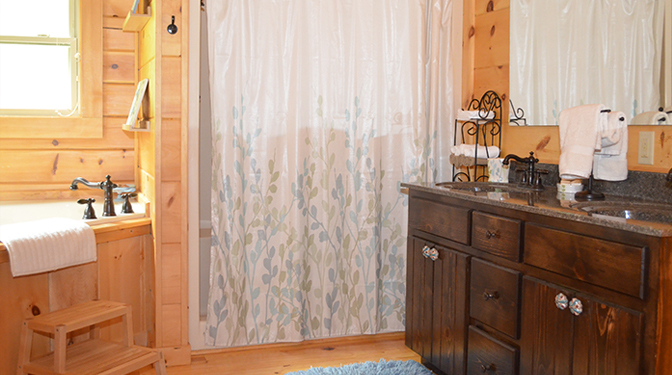 It was super cozy, clean, well stocked, they have literally thought of everything to make your getaway perfect! We were thrilled to see they had even decorated for Christmas! We enjoyed time in the hot tub, we built several fires (with the fire wood provided) in the fire pit by the stream! We went for hikes and jogs along the trails, and just really had a fantastic time. We are already planning our next stay!!!! Thanks, Mike, for being such an amazing host!!! Great home, right next to the creek so we could go explore. The clear nights offer a great time for a bonfire and star gazing. Everything you need is in the house, we were able to make a great Thanksgiving dinner. Mike was so kind, he made sure we had enough wood to have a fire almost every night. 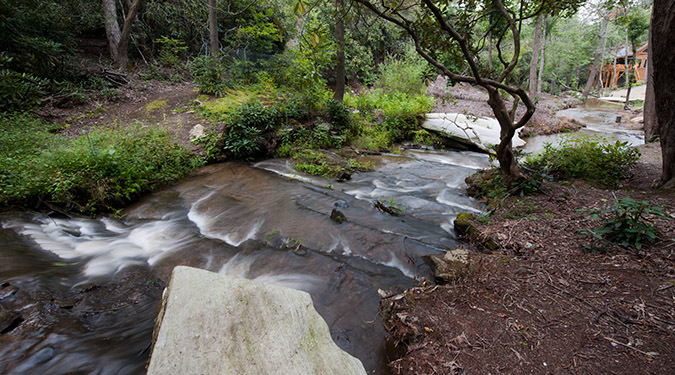 Lots of places to visit: Catawba waterfalls, Grandfather mountain, Zip lining, Skinny dip waterfalls, downtown Black Mountain, NC Arboretum, fly fishing at Curtis Creek, and the drive provides lots of opportunities to spot wildlife. We will be back for sure! 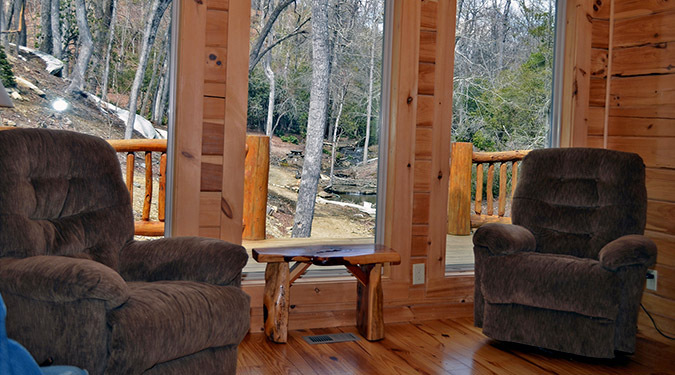 The properties at High Rock are in a great location, secluded, yet minutes from town. 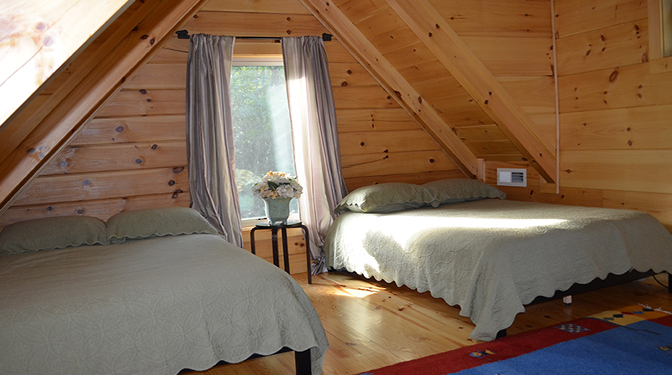 The cabins are well appointed, clean and comfortable. Mike, the owner and manager, is awesome to work with! His responses are quick and he's happy to address any concerns. As returning customers for several years now, we have never been dissatisfied, and we'll be back again next year!